President Rodrigo Roa Duterte’s delivered his 3rd State of the Nation Address (SONA) at the Batasang Pambansa and made a historical mark. 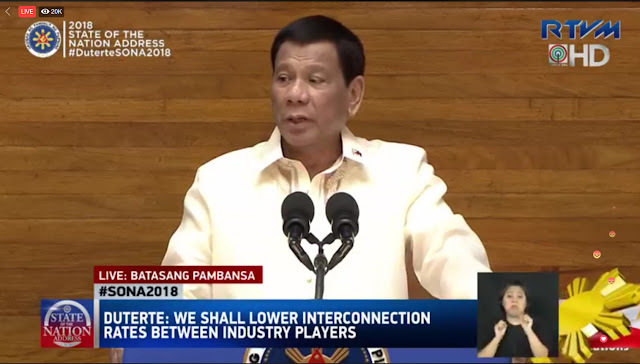 Literally the 3rd SONA broke the tradition. Check out below what are the firsts on this SONA and the highlights of President Duterte’s speech. This is the first time that the SONA didn't start exactly at 4:00 PM. This is the first time that the before the start of the SONA there’s a sudden change of leadership in the house of congress. This is the first time that President Duterte read his speech without any unnecessary words. This is the first time that the SONA speech took only less than an hour. This is the first time that President Duterte’s SONA didn't put highlights on the achievements but on what to be done. With so many firsts it is only right that today’s SONA would be recognized and made a mark in the history of SONAs. As to the highlights of President Duterte’s speech we’re sharing what we can grasp from it, read it below and share what you think of it. About 2 years ago, I solemnly took my oath as a worker of the national gov’t. I was inspired to institute real changes for the greater good of the Filipino people. War from illegal drugs is far from over and will not be sidelined, instead, it will be as relentless and chilling. Corruption must stop to improve delivery of services. He warned government agencies to stop red tape. Directing government agencies in implementing the Ease of Doing Business Act. He mentioned that he will sign (Bangsamoro Organic Law) and ratify the law. He asks for 48 hours. He hailed the successful hosting of the ASEAN anniversary and summit that happened last November. The relationship with China has led to an unprecedented level of cooperation. The shared intelligence with China led to the discovery of clandestine shabu laboratories. He admired our Filipino migrant workers for their selflessness and courage in enduring hardships of living away. Mentioned about the fight against ‘endo’ which has resulted to regularization of more than 300,000 workers. Another highlight is the protection of the environment which discussed the open pit mining. The economic sabotage of which he warned the rice cartels to stop messing with the people. The passage of the universal healthcare bill. He recognized the people behind the drafting of the new Constitution (Federal Government). What can you say about President Rodrigo Roa Duterte's SONA?